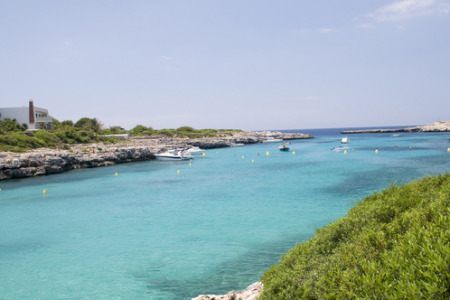 Cala Santandria holidays take you to the beautiful north west coast of Menorca, a short distance from the old capital Cuidadella. Essentially, it is a family resort where those with young children can enjoy the sandy beach and the safe shallow waters. Couples of all ages looking for a place in the sun amid a pretty landscape, where they can unwind and forget the stresses of home are also fans of the area. The resort lies very close to Cala Blanca and Cala Caleta, so much so that recreational facilities can be easily shared, giving a greater variety of activities. Fly from your local airport. Low cost flights make regular trips to Ibiza from regional airports making the journey easier and certainly cheaper. The holiday season lasts from Easter until late October with temperatures rising from the low season average of twenty degrees to the low thirties during the height of summer. Cala Santandria is a truly delightful resort. Its accommodation of hotels, apartments and villas caters for most budgets and reaches high standards. Service is very good and nothing is too much trouble. The restaurants and bars serve a wide variety of food. Do try local dishes, often fish based, for a culinary treat. Don't forget the accompanying wine which is as inexpensive as it is tasty. The resort has a fairly limited number of shops, sufficient for essentials, but not much more. With Cuidadella on your doorstep, this matters little. You can have a real shopping extravaganza there. Nightlife can be fairly lively by Menorcan standards, but the resort retires long before dawn. Compare holidays to Cala Santandria today. Looking for sun and relaxation in a very pleasant resort then Cala Santandria holidays will fit the bill. If the thought of trawling through web page after web page looking for the best deal does not appeal, try our simple search facility. You'll find over three dozen travel companies, including leading brands, competing for your custom. It is simple to use, and remember, competition brings out the best bargains. Our search facility enables you to see, at a glance, the Cala Santandria holiday that is the cheapest, and the one that offers the best value for money. It couldn't be easier. All you have to do to secure the holiday is make a phone call. As offers change daily, in order to avoid disappointment, you should ring today.